This album featuring Dan Wilt, Andrew Smith and David Ruis, is perhaps the best TFH album released thus far. I have thoroughly enjoyed the uplifting praise in the first set. It is directly focused at the Lord and His goodness. The music written by Dan Wilt and Bruce Ellis of the Cambridge Vineyard Christian Fellowship, is very powerful and strong, leading the worshiper into a definite experience of the presence of God. 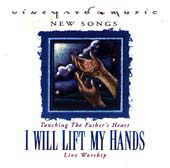 The song I will Lift my Hands is a marvelous song that has a very simple chord progression but is very fresh and intimate. The second set of worship is also refreshing because it offers a fun array of musical sounds. Andrew Smith rocks things up and passes the torch off to David Ruis for Every Move I Make. The album ends in an appropriate way with a declaration of commitment - all my fountains are in You. I have enjoyed this volume of TFH and hope that there are more like this soon to be published by the VMG. Brian Woodman <dwoodman@ciaccess.com> From Kitchener (where I usually live), Ontario, Canada. Attends the Cambridge Vineyard CF in Cambridge Ontario and studies Theology and Missions at Emmanuel Bible College.